Garage Door In Need Of Repair? What's Wrong With My Garage Door? You might not know the answer, but we do! Your garage door is a complex piece of machinery, which means that problems could be coming from any number of parts related to it. One of the most important components is actually your opener. Any number of troubles may occur in relation to the opener, rather than your door itself. Our technicians will be able to tell if this is the case, and then take care of it. Whether its sensors need to be realigned or worn out parts either repaired or replaced, we'll know what course of action is best for your opener. Sometimes just a few simple adjustments may ultimately make a huge difference in how well your garage door functions. If you're not even sure where to begin looking for worn down parts, or what they even are, don't fret! That's what the experts are here for. Our team will be happy to come out and locate the source of the trouble, then tend to it with ease. The cables of your garage door are what do the heavy lifting, supporting the weight of it as it opens and closes. If they're worn down, or broken altogether, that means that your door won't be going anywhere. That's where we come in! We can repair or replace them as needed and get your door in working order again in no time. The same goes for the rollers or hinges of your garage door, and taking care of those can make your door quieter and work more smoothly! While you may think that the cracking and warping of your garage door's panels is merely an aesthetic issue, this damage can be far more worrisome than just how it looks. Continued use of your door with these impaired panels can lead to bigger issues later on, such as your door becoming misaligned. This can lead to destroying the other parts of your door to the point of having to purchase a new one altogether. Don't Let the Repairs Wait! 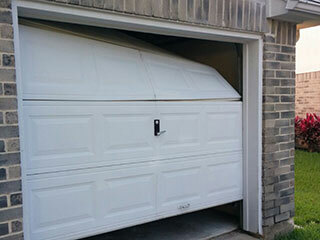 Contact Garage Door Repair Stillwater today, and let us help you. You'll be saving yourself time, money, and frustration later on. Call now!